I Run Ultras.com: Caminho da Fé Limited Addition T-Shirt Available Now! Caminho da Fé Limited Addition T-Shirt Available Now! 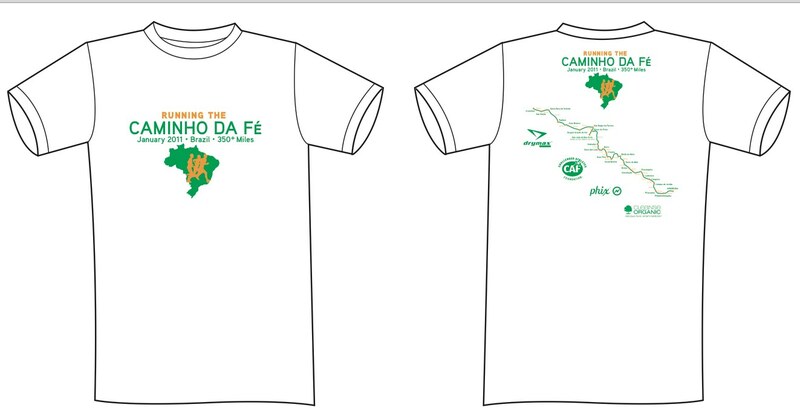 For a limited time only, you can get your one of a kind, limited edition, Running the Caminho da Fé t-shirt, designed for Running the Caminho da Fé by ultra-runner Rick Gaston. All proceeds will go to the Challenged Athletes Foundation. Each cotton t-shirt is $19.99 (including shipping charges). If you are interested in purchasing one (or more) of these fantastic t-shirts, send us an email with your name, shipping address, number of shirts desired and shirt sizes. [UPDATE: December 5, 2010, 4:51 PM] - Within moments of this post we received several inquiries regarding the availability of tech t-shirts. Our intent was to print a limited number of not-for-sale tech t-shirts, but if demand dictates we will offer tech t-shirts for purchase. Let us know if you have an interest in purchasing tech t-shirts and we will e-mail you the prices should they become available. [UPDATE: December 6, 2010, 9:13 AM] - Tech t-shirts are available for $29.99.